A great compromise for users who don’t want to spend too much on their purchase but still value the quality of its output, the Nikon 8397 ACULON AL11 is the best rangefinder with a trade-off between price and functionality which doesn’t sacrifice a lot of the latter. You’ll find all the basic features you’d expect from a rangefinder in this price class, while the Nikon 8397 ACULON AL11 is also designed with quality materials and an attention to detail which will make you wonder why it’s priced so cheaply. One of the more notable features of the model is its portability. Being one of the smallest models in its class makes it stand out from the rest and it’s a great pick for those who like to pack lightly and don’t need any extra gimmicks in their package. It’s not only small but very lightweight too, and you can easily forget you’ve packed it in your gear once it’s in there. Continuous measurement mode works for up to 20 seconds, and you’ll get a clear reading of the current target distance straight through the viewfinder, along with a simple battery level indicator. That’s pretty much all you’ll see on the display, as Nikon have chosen to go with a minimalistic style to their interface with this model, following the same trend as with the whole device itself. This model prioritizes distant targets, so if you ever need to get precise measurements for something that found itself stuck in foliage, this is the kind of device you need. On the other hand, this means that its algorithms are going to ignore closer targets, but that’s exactly what you’ll need most of the time when you’re out in the field using this model in the first place. 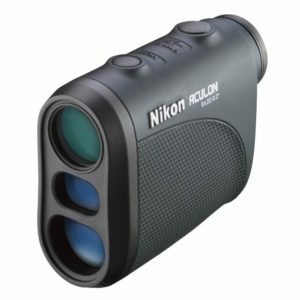 Last but not least, you can get some additional visibility on your target area thanks to Nikon’s advanced optics, something the company is renowned for. Up to 6x optical zoom is provided, and the lens attempt to spread out light levels across the entire color range, normalizing the image and making it clearer and more readable. This works especially well in more difficult conditions that can give trouble to other similarly priced devices.